Love riding? 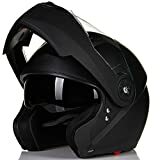 Then a helmet is a crucial aspect of riding, and the list below outlines some of the vital factors that can help in choosing the safest motorcycle helmets in the various automotive stores. The motorcycle is one of the most popular vehicles used worldwide nowadays, as it is a fast way to reach the destination without having to be concerned about a parking lot or the traffic that you may be exposed too. For the motorcycle to be a safe way of moving towards town, you need to be very careful and wear a motorcycle helmet. 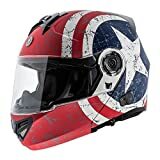 Which one you have to choose is up to you, as below there are presented ten of the best motorcycles helmets on the market. The sun-visor attached to this helmet is retractable, so there is an instantly vary of the light conditions. The shield disposes of a click release technology which makes it faster for the user to replace the shield, without the need for some other tools. The material used for the manufacturing of this helmet is an advanced thermic polymer alloy. The only disadvantage present for this helmet is the high cost of purchase. 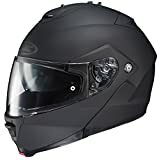 For the features that it presents, this helmet may reach a price which is too high, but in terms of comfort and safety, it may be a good choice. The weight of this helmet is not too light as there is for the others, and also, there is the totally lack of technology that can be counted as a disadvantage. The helmet offered by the GDM comes in a Matte Black version. Its architecture is in such way designed that it will provide an aerodynamic shape, being also a light helmet, in its manufacturing process being used a poly – alloy composite. The chin strap uses a Double – D ring technology, while also ensuring a removable as well as washable liner and cheek pads with the same features.If purchased, this helmet comes also with a set of 2 visors. The visors that are offered as a bonus are clear and free tinted right in the box of the product. A big disadvantage is a fact, that despite the lack of technology in this helmet, there is a pretty high price to pay for it. The series helmet produced by the ILM is a generic helmet as it can be bought for a reasonable price. It comes in multiple color versions, and at its buying, you also get a second visor, besides the classical clear one. The bonus one is a smoked one. Also in the purchase there is included a neck winter scarf. The presented design, an aerodynamic one, contains a feature called “streamlines” which is responsible for reduction of noises produced by wind and also reduction of drag. 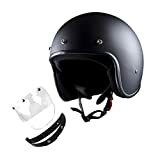 As for safety, this helmet includes a durable ABS shell feature, applied by using the advanced technologies, in order to do not increase very much the weight of the helmet. The only minus for this helmet is that it does not come with something new and revolutionary. A type of helmet like this is preferred due to the accent that was put on the comfort of the driver during its manufacturing process. The 1Storm made sure that the helmet would be lightweight in the true meaning of the term, as they use a thermoplastic alloy shell, and also gave it an aerodynamic and attractive shape. The ventilation system is also worth mentioning as they implemented a system with 3-level ventilation control on top and 5-position channel for ventilation. Along with the interior, this helmet is a heaven for the comfort-oriented drivers. The aspect can’t be neglected either, as there are a few models which are a little bit non-conformist, but still very attractive to the eye. In the production of this helmet there was no big accent put on its performances, besides the one that regard the comfort. 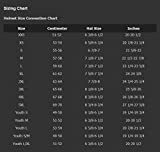 WOW helmet is another helmet that was made for series commercialization, as they did not ensure very much features on it, besides the ones that are concerning for almost every driver, more explicitly, the comfort and also the main characteristic of a helmet, the safety. As for the comfort, the WOW helmet is very similar to the 1Storm one presented earlier, as there are manufactured using the same alloy. The design is a little bit different, but it also ensures the aerodynamic feature. The interior is cushioned and comfortable and besides that, it can be removed and washed, as there it is the padding. The designs of this helmet are various, and still non-conformist, so the drawback still remains the lack of implication on other features of the helmet. TORC comes with a helmet that has equipped on it a panel enhanced with an optically correct flat shield. Also there is a feature which can be seen as an adaptation as there is a liner which is specifically tailored for the intermediate oval head shape, a liner which is laser contoured. The lock down of the visor system is a smooth designed one. The interior is washable as it comes in a removable form, and not only that is washable, but for this process there can be used the washing machine and still it will not be deteriorated. “Biohazard” is a full face helmet that was created using an ABS shell technology, with high pressure, by taking into account a thermoplastic material. Also, there is present on this helmet a multi density EPS liner, as long as a ventilation system which disposes of extractor liners both on top, respectively rear. The visor attached to this helmet is a double PC anti-scratch, and the DVS treatment is removable, also enhanced with a system that ensures a quick change mechanism. A drawback that would be considered by many eventual buyers is that on the construction of this helmet there was no big consideration put on the comfort of the driver. The classical lightweight polycarbonate ABS shell is also present on this helmet, making sure of the fact that the helmet will not be a burden for a driver and that it will feel comfortable. Also the shield is protected against the obstacles that may appear in the nature having implemented on it NutraFog II anti-fog technology, as long as a UV protection. A twin shield system implemented on this helmet give an additional protection to the user of the helmet, by conferring protection for his eyes again the sun rays, and also allows for an easy retract of this shield, disposing of a switch responsible for this process. Also, the helmet is enhanced with an easy to release chin strap, which is, of course, easy to secure too. The interior can be easily removed, in order for it to be washed, as many times as the user wants to. And nonetheless, the fit of the helmet is a standard intermediate oval. The shell for this one is not made as for the others. In its manufacturing process there was used an advanced LG polycarbonate, designed in order to minimize the weight of the helmet as well as dispersing the eventual impact. The technology left its print over this one, by adding a font mask that can be removed as it is attached using some neodymium magnets. Using a helmet when riding motorbikes is as crucial as any other accessory of a bike. An individual may choose to ride without the helmet but safety is not guaranteed for them. Deadly accidents are more likely to be experienced by motorists as compared to those who drive cars. The extreme conditions can be avoided by using the right type of helmet. It is recommended that one should acquire a helmet with extreme care and vital factors should be considered. Individuals differ in personality, body sizes, and shape. As a result, every person should be aware of this. An individual can always refer to a friend to know whether their face and head are round, intermediate or long oval. A rider can use a tape measure to measure the size of his/her head and then compare it to the measurement indicated on each helmet in an automotive store. The helmets that put pressure on certain parts of the head should be avoided by all means. A helmet that fits correctly without putting any sort of pressure is the safest one that should be used when riding. Therefore, when at a store, always ensure that you put on the helmet first and check if it fits comfortably like a crown before buying. A comfortable fit of the helmet will ensure that the helmet remains established in any event of an accident or a crash. For a right helmet, a full face grip should be felt when trying to move the helmet. Before purchasing, an individual should put on the helmet, secure the straps and try to roll off back and front. For a safe one, it will remain on the head. This is the one that is most likely to secure you in case of an accident. The helmets that don’t retain when doing the roll-off test aren’t going to offer protection in case of an accident. Such should not be bought as they are not safe at all. The visors can either be in-built or removable depending on the motorbike and condition of the roads. Since most visors are plastic, one should choose the one that is transparent for safety purposes especially at night. Motorists should choose the one that allows free air passage to prevent obscured visibility when it’s foggy. In motorbikes that have windshields, the required visors are those that guard the eyes. Motorist should avoid purchasing the visors that tinted given that they pose danger during certain weather conditions despite being an attraction to customers. Safety is better than color preference in matters concerning visors. A proper inner cushion of the helmets aims to protect the skull from damage during fatal or even minor accidents. A good helmet is supposed to absorb the shock generated in case of accidents and maintain the integrity of the skull. Helmets with poor cushioning can result in brain trauma or broken skulls and later on permanent cognitive troubles. As long as the helmets do not firmly fit, they cannot cushion a motorist. Always strive to purchase fitting helmets as they are the ones that will give you perfect cushion. Safe helmets are those that have been certified by the Indian Standards Institute. The Indian government through the Bureau of Indian Standards (BIS) gives assurance to motorists that helmets with the ISI mark are of quality and conform to Indian regulations. These certified helmets are not prone to breakages when an accident occurs. However, the buyers should be cautious since there are helmets with fake ISI marks. These fake helmets do not offer any protection. They are made of plastic materials which often crack or break in an event of an accident. Buyers should always strive to purchase genuine helmets. The rider helmets come in various designs and styles. The designs are essential is a rider’s overall protection. There are small, medium and large helmets available in the automotive stores. The designs are either, full face, open face or half face. The full face helmets give full facial coverage and in case of an accident. The full face helmets are preferred for motorcycle training sessions because of the maximum protection offered by the helmets. Riders who usually ride at slow speed prefer the open-faced helmets. Before purchasing a helmet, a rider should think of what the purpose will be. The safest motorcycle helmets are those that are durable. No motorist wants a helmet that wears out after a certain period of time. On the other hand, the thicker straps are more durable as compared to the thin ones which often dig into the skin making a rider uncomfortable. The durability of the straps determines whether a cycling can pull off a buckled helmet or rotate his/her head freely. A rider can always check on other people’s reviews before purchasing a helmet. This will guide one into buying the safest motorcycle helmet. Cooling system technologies have been employed in the manufacture of safest motorcycle helmets to reduce heat during hot weather conditions. A poor helmet will retain heat making cycling uncomfortable. The safest helmets often have vents that allow free circulation of air in and out of the helmet. The air will get in from the top vents and circulate around one’s scalp. The warm moist air will then be exhausted through another side vent. Ventilation is also crucial in improving clarity to the visor. On the other hand, the ventilation in the safest motorcycle helmets often prevents stench from building up. Therefore, the riders should always strive to purchase well-ventilated safety helmets. In order to purchase the safest motorcycle helmets, the riders should cautiously check on the sizes of the helmets, visor properties, and durability. Moreover, comfort, ventilation and durability properties should be of consideration. This information on the guide to purchasing the safest helmets can always be shared with other riders. Safety is always a priority when it comes to motorcycling.